An Aug. 2, 2017, memo from Deputy Attorney General Rod Rosenstein appears to be the first public indication that Mueller has been OK'd to probe collusion. Deputy Attorney General Rod Rosenstein authorized special counsel Robert Mueller to investigate whether former Trump presidential campaign manager Paul Manafort colluded with the Russian government to affect the outcome of the 2016 election, according to a newly released classified memo. The partially redacted Aug. 2, 2017, memo from Rosenstein to Mueller, released Monday night as part of a broader court filing, includes specific details regarding the scope of Mueller's investigation, including allegations that Manafort committed "a crime or crimes by colluding with Russian government officials with respect to the Russian government's efforts to interfere with the 2016 election for president of the United States, in violation of United States law." The memo from Rosenstein, who is overseeing Mueller's investigation, appears to be the first publicly released evidence showing that Mueller has been authorized to specifically investigate collusion during the presidential race between the Russians and top members of Donald Trump's campaign. The filing late Monday by the Office of Special Counsel comes in response to a motion filed by Manafort's lawyers to dismiss an October indictment related to his lobbying work for Ukraine. Manafort had previously argued, in part, that Mueller's prosecution of crimes tied to Manafort's business in the Ukraine was outside of the special counsel's assigned scope. But in its response in the filing, the U.S. government said Rosenstein specifically confirmed to Mueller's office in the memo that allegations that Manafort committed a "crime or crimes arising out of payments (Manafort) received from the Ukrainian government before and during the tenure of President Viktor Yanukovych" were within the scope of Mueller's purview. Mueller's prosecutors note that this memo has not previously been disclosed, has not been presented to Manafort, and contains redactions because they say that "it is classified and contains confidential and sensitive information that cannot be publicly disclosed." A federal judge will likely hear oral arguments on the filings from Manafort and Mueller's team at their next hearing on April 19. 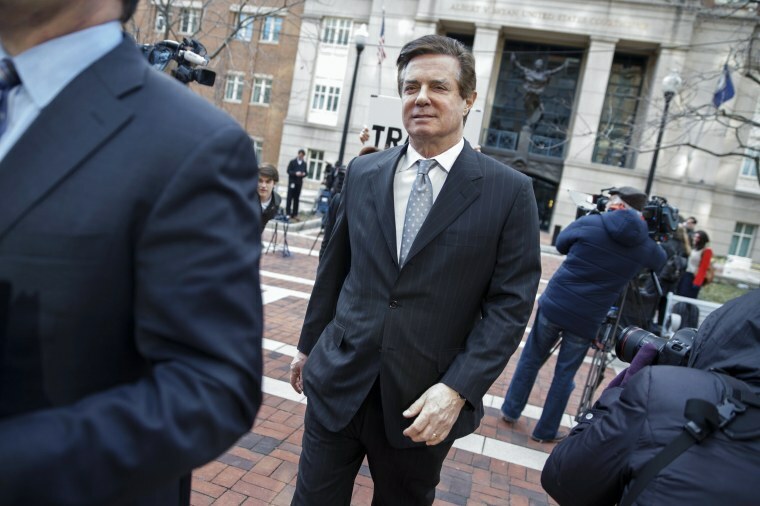 Manafort pleaded not guilty last month to bank fraud and other chargers, just months after he was indicted in Washington on conspiracy and money-laundering charges. He also pleaded not guilty to those charges.